"Warrior 481 is cleared to Pontiac as filed, climb and maintain six thousand." "Woo hoo!" said Kristy from the right seat, sufficiently experienced now to appreciate the benefits of being cleared "as filed" while flying on an instrument flight plan. We settled in for a smooth flight westward over Niagara Falls, Ontario, and southeast Michigan. Over a year had passed since we last visited with my Dad and stepmother in Tennessee. Neither he nor I had been to visit my grandparents in Michigan since November 2013. 2014 was a challenging year for all of us on several fronts and it was well past time for us to converge on Oakland County to visit and spread some cheer. After all, who wouldn't want to have this delivered to their house? Departing at 5:00 pm on a sunny Friday in September, Niagara Falls was already in shadow by the time we flew overhead on our mission to Michigan. Indeed, this was the view directly in front of us for the entire 2.5 hour flight, the glare effectively making this an instrument flight despite good visibility and a clear sky. It was an unfortunate alignment of heading, time of day, and time of year. Fifteen miles from Oakland County International, the sun sank into haze near the horizon, its output shifting toward the red. In a seeming effort to hasten the end of a day's journey, the copper disk rapidly dwindled, as though viewed through a closing iris, and disappeared. No longer blinded by the sun, I informed Detroit Approach that the airport was in sight. Cleared for landing on runway 9L, we were momentarily wingtip to wingtip with an Arrow on approach to the parallel 9R. It was faster than us and reached the airport first, but we were down and stopped sooner and in much less distance. It all comes down to energy management and I am more acclimated to landing on short runways. Once parked at Michigan Aviation, my mother arrived to take us to a late dinner at Qdoba, which we cannot get in New York. The next morning, we met my buddy Garrett (a pilot and former Air Zoo docent now living in Waterford) for breakfast at a diner in my hometown. It was my first time back in Clarkston since November 2013 and I asked Kristy to take this picture of me and The Bear as proof that we were actually there. As I have said before, after twenty years away, memories of my home town feel like they belong to someone else. We found this alien on the sidewalk leading to the little house I grew up in. Oh boy, my dad and grandparents were clearly in for a treat that afternoon! After a stroke and a stay at a rehabilitation facility in 2013, my grandfather is back home with my grandmother. Unfortunately, neither of them gets around extremely well and I don't think that living in their condo affords them opportunity to do much of...well...anything. Having such a goofy Bear in their midst for a few hours must have been both a lovely diversion and absolutely disorienting for them. They were glad to see us though and, in that, was a mission well accomplished. The next day, after another terrific breakfast at the Old Village Cafe, we took The Bear to a playground at Clarkston Elementary and let her run off excess energy before spending the next few hours in the Warrior. Just as landing an airplane is all about energy management, so too is flying with The Bear. Frankly, I think she just likes being able to look down on me from above for a change. I sat in the living room of my late-childhood home and filed a flight plan from Oakland County International back to Williamson-Sodus. As described previously, the last several times we departed a towered, metropolitan Detroit airport for Sodus, we have been given an undesirable IFR routing over Lake Erie starting with MOONN intersection. To avoid this, a few people have recommended including a "request no flight over Lake Erie" sort of remark in the flight plan. When the expected route from the FAA materialized on my iPad, it was the same MOONN-V90-DKK-BUF clearance (i.e., a low altitude MOONN5 departure procedure with a DKK transition) that I hoped to avoid. Deciding that the route was probably computer generated and that there would be time for human intervention later, we departed for Michigan Aviation. Usually, we use the Pontiac Air Center (PAC) when we visit Oakland County International. The fuel prices tended to be the lowest on the field and the owner, Doug, has always taken good care of us. He helped preheat the Warrior on a cold morning in November of 2006 when my primer was not working. He pumped up the nose strut when it went flat after we were forced to abandon the Warrior there for a week in 2011. While planning this trip, I noticed that their hours of operation had changed to a 5:00 pm close. Arriving nearly three hours after PAC's closing on Friday, we parked at Michigan Aviation instead. Sunday morning, it was obvious from the Michigan Aviation ramp that nothing was happening at PAC. When I asked the lineman about it, he shrugged. "Some kind of SNAFU," he said, explaining that PAC shut down a month previous for reasons unknown to him. Evidently, no one notified air traffic control of the closure. For a time, the tower still sent arriving aircraft to PAC, only for them to be met on the ground by security and turned away. Kristy and I patronized Doug and PAC for nearly eight years over the course of many trips into Oakland County International. Now we wonder what became of them. Although Pontiac Ground cleared us home via the MOONN intersection routing, the controller informed me that we would receive radar vectors to keep us from flying over water. While I appreciated that ATC responded to my flight plan remark, I still had to spend a few minutes dialing the original route into the Garmin 430W. Aloft, Detroit approach vectored us about five miles north of the airport (directly over Clarkston), then cleared us for a right turn direct to Buffalo. "That should keep you from flying over the lake," he noted. Nearly an hour later, a Toronto Center controller would call and say, "hey, Warrior 481, how would you like direct to your destination?" Toronto Center made it look it easy. After turning direct to the Buffalo VOR, I looked down and realized that we were paralleling Clarkston Road. This road connects the Village of Clarkston to the Lake Orion farm where I spent my early childhood. My eyes followed the road until I saw the familiar shape of Elkhorn Lake, upon whose shores I lived and played as a child. The farm is now a housing development and sandy evidence of new construction was apparent below. After nearly 20 years of trying, the last of the farm's subdivided properties is sold and no one in my family owns any of that land down there anymore. It seemed an odd coincidence to overfly the farm for the first time in nine years just weeks after the property passed out of my family's control; the ultimate visual reminder of "you can't go home again". With the mission in Michigan accomplished and a satisfactory route programmed into the navigation system, there was little more to do but listen to quiet symphonic music from the iPad while watching the autumn landscape roll past. Kristy and The Bear both had their noses in books as we flew. "Are You Pondering What I'm Pondering?" Back home, we pushed Warrior 481 into the hangar. Actually, it's a new hangar to us; we recently moved to a south facing "T" hoping to have an easier time with ice on the ramp this winter. Kristy and The Bear took care of cleaning off the bugs while I logged the time and put the cockpit into order. On the drive home, I pondered several questions. - Why are we so much at the mercy of celestial objects? We were assaulted by the sun while flying west and challenged by the MOONN going east. - Why is it trivial to fly IFR direct from Sodus to Pontiac, but the reverse course always requires negotiation? Is it an aerial one way street? A Zener diode? - Does Santa Claus do his thing at night so that he doesn't have to fly directly into the sun the way we did? If so, he's really clever. - If a lead acid battery could be constructed to deliver the equivalent current output of the Lewiston Pumped Storage facility, how big would it have to be? - Is Niagara Falls really nothing more than a leak in the east end of Lake Erie? If so, are the falls the only things keeping Cleveland from flooding? - What is the shelf life on cheer spread by a Little Bear who visits her great grandparents by airplane? "And one day, I am gonna grow wings, a chemical reaction"
I believe that all kids should experience having wings at least once. No, I don't mean like this; not with vestigial novelty store wings attached by Velcro. Not by being hopped up on Red Bull. Not with chemical reactions of the psyche a la Radiohead. Rather, with actual wings that do what actual wings do: bear them aloft into the free medium of the sky. One of my objectives at the start of 2014 was to give more airplane rides. So far this year, I have flown with lapsed pilots, student pilots, paying passengers (for the first time), friends, coworkers, and kids. Harking back to my time in South Haven, when Dave and I held "Take Your Coworkers to the Airport Days" at the field, I invited several friends and their families to Sodus for airplane rides. When she learned that I was planning to fly rides, The Bear said, "you're flying rides tomorrow? Am I going to be there? Can I help fly the plane? I won't do any crazy stuff unless people are ok with it." That morning materialized in High Definition, the air so clean and crisp that even the elusive shore of Canada was visible across Lake Ontario at pattern altitude. I flew with three kids, two of whom took control of the Warrior for the first time to really spread their wings. Mom or Dad, on the other hand, were relegated to the back seat - but I expect that they had fun, too. It was a wonderful morning of sharing my avocation with friends and I was appreciative of the weather for cooperating so magnificently. Sometimes, there are opportunities to come full circle. September 17, 2005: Devon takes wing in South Haven, MI. Photo by Dan. 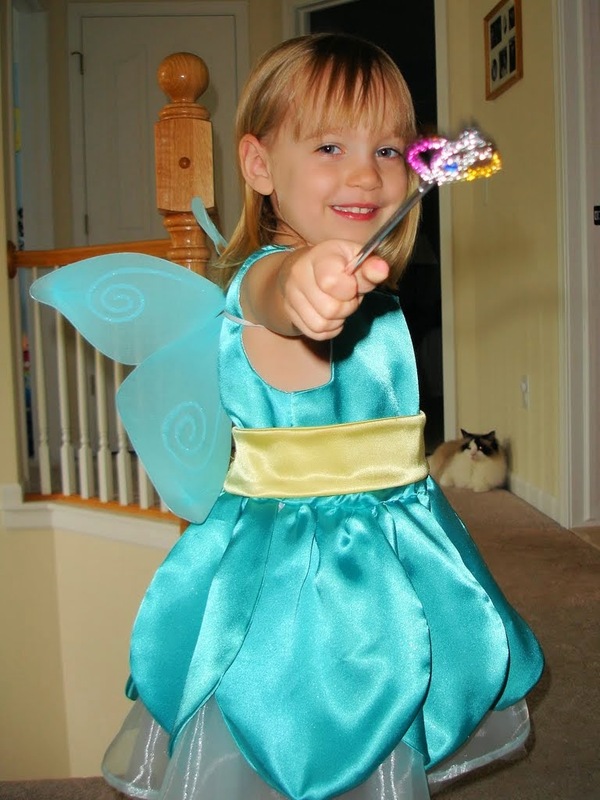 Devon, the six year old daughter of two close friends, was the first kid to ever fly with me back in 2005. We departed the paved runway at South Haven Area Regional Airport, banked toward the sandy Lake Michigan shore, circled the little red lighthouse on the end of the pier, and made a smooth landing on the grass. Just over nine years later, Devon found herself in Warrior 481 again, this time in the right seat. This flight, displaced from her first by time and distance, launched from Sodus, NY to fly along the shore of an entirely different great lake. Aloft on the threshold of sunset, she took control for the first time, smoothly exerted her will over the airplane...and grinned. "Flying a plane is like steering a horse," she observed, astutely realizing that the airplane already knew how to fly and that all she needed to do was gently, firmly point the Warrior in the direction she wanted to go. As we wheeled over the Lake Ontario shoreline, daylight retreated over the edge of the world, leaving a dramatic sky in its wake. Tattered pink clouds stretched over a similarly tattered lakeshore as Devon flew a circle around one of the smaller bays east of Sodus. The Warrior's wings turned pink in a pale imitation of the sky. Devon explored the countryside under lingering twilight, ranging as far south as Geneva, NY. Once the residual daylight completely melted from the sky, we returned to Sodus for a night landing. "Today was a big day, but in a plane, everything looks small," Devon wrote in my logbook. One of the greatest joys as an aviator is seeing the magic of flight through the eyes, and smiles, of others. 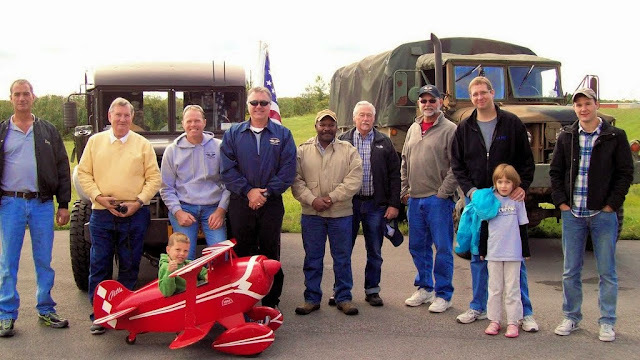 A loose group of aircraft from the Williamson Sodus Airport navigated crystal clear air under a 2500 foot broken ceiling to attend the EAA pancake breakfast at the Oswego County Airport. Flying in Warrior 481 with me was The Bear, relegated to the back seat, and new club member and student pilot, Matt. Everyone had a wonderful breakfast, including Matt for whom this was a first experience with the hallowed aviator's tradition of fly-in pancake breakfasts. As great a time as we had, this journey was also bittersweet for it marked the end of an era. 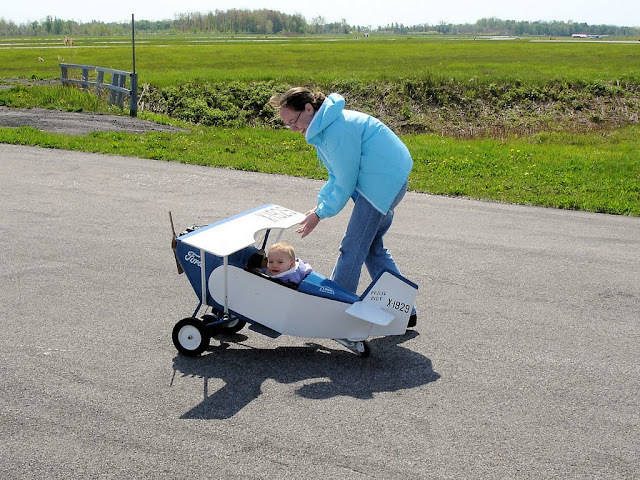 As a result of her current height, The Bear has aged out of her beloved EAA 486 Pedal Plane Air Force. She no longer fits in the aircraft! In celebration of this milestone, I offer a pictorial retrospective of The Bear's career as a pedal plane pilot. Dual instruction with Kristy on May 11, 2008. Unpowered solo in 2008 (note that the legs are not long enough to reach the pedals). By April 8, 2010, The Bear was successfully navigating the ramp solo in all three available aircraft. On September 11, 2011, The Bear conducted a joyous flight to reclaim aviation from those who sought to turn airplanes into instruments of terror a decade previous. In July of 2012, the cockpits were becoming a bit snug. 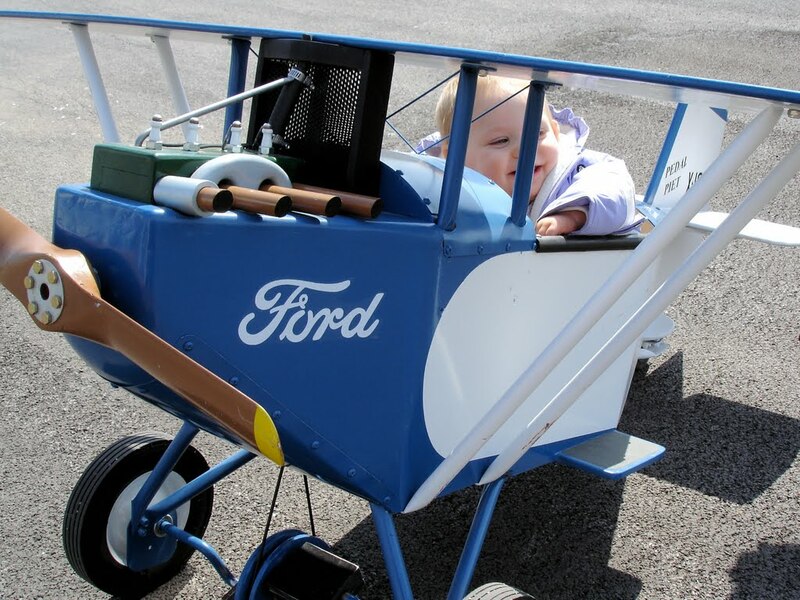 And in 2014, she needed to be lowered into the cockpit via Daddy-Hoist(TM) and was unable to pedal without smacking her knees on the bottom of the instrument panel. Just look at the size of those feet! Thus ended a distinguished, six year career in the Pedal Plane Air Force. I guess she'll need to move up to something larger one of these days. Warrior 481 was due for an oil change and, as we all know, hot oil drains best. Warming the oil is one of my favorite excuses to fly. For the record, my other favorite excuses to fly include (1) so-called $100 hamburgers, (2) vacations, (3) visits to airplane museums, (4) giving airplane rides, (5) visiting friends and family, and (6) because I feel like it. With a Monday evening flight decided upon, I needed a destination. Hmmm... I was uninspired. I fired up ForeFlight on the iPad and overlaid fuel prices on the digital chart. Cortland County Airport in Cortland, NY had the lowest fuel price ($5.55/gal) within a thirty minute flight of Sodus. Bingo, destination chosen! It was as good a reason as any and I have only landed at Cortland once previously. As I flew over the north end of Cayuga Lake and the Montezuma National Wildlife Refuge, both aglow under the warm rays of a setting sun, a subtle change was visible in the landscape. There was a color shift toward the red that could not be fully explained by the amber sunset. Summer was ending and, in its waning, the landscape hinted at autumnal magnificence. I did not plan to take any photos until I saw this odd, partially flooded washboard below. Trucks threw long shadows on I-90 as they passed through the Montezuma Wildlife Refuge. The Erie Canal passes near Mary's Point Pool in a confluence of waterways and roads. This swamp on the north end of Cayuga Lake would almost resemble some of those images of nebulae collected by the Hubble were it not for that cabin in the upper right corner of frame. Cayuga Lake is the longest of the Finger Lakes (38.1 miles long). Long shadows were thrown across a quilt whose squares were no longer the uniform green of summer. The nighttime flight home under a full moon was also beautiful, but in very different ways.